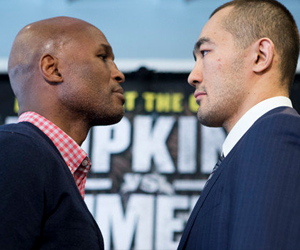 Bernard Hopkins will attempt to become the oldest fighter in boxing history to unify world titles when the IBF light heavyweight champion opposes WBA champion Beibut Shumenov on April 19th at the DC Armory. ''I'm trying to force history to write another book on me,'' the 49-year-old Hopkins said Tuesday. Hopkins (54-6-2, 32 KOs), of Philadelphia, already holds the records for oldest fighter to win and successfully defend a title. He captured the IBF crown in March 2013 with a decision over Tavoris Cloud, and then defended it with an October win against Karo Murat. Shumenov (14-1, 9 KOs) is a 30-year-old native of Kazakhstan who lives in Las Vegas. He won the WBA title by defeating Gabriel Campillo in 2010 and has made five successful defenses. "Fighter if the Decade" Manny Pacquiao sparred four rounds with undefeated Lydell Rhodes (1909, 9KO's) at the Pacman Wild Card Gym in his hometown of General Santos City on Tuesday under the watchful eye of trainer Freddie Roach. Pacquiao's adviser Michael Koncz told the Manila Standard that Pacquiao "looked good" against the shifty Rhodes, a one-time protege of Floyd Mayweather Sr, father and trainer of unbeaten pound for pound king Floyd Mayweather Jr.
Koncz described the first day of sparring and Pacquiao's regular routine as "a tremendous workout." His seriousness in training for the much-awaited rematch with WBO welterweight champion Timothy "Desert Storm" Bradley at the MGM Grand Garden Arena on April 12, prompted Pacquiao to beg-off from standing as principal sponsor at the wedding of "Bai" Elorde, grandson of the late world junior lightweight champion Gabriel "Flash" Elorde in Manila on Wednesday afternoon. Koncz said Pacquiao had requested close friend and Ilocos Sur governor Luis "Chavit" Singson to represent him at the wedding. Miguel Cotto (38-4, 31 KO’s) to come in around 155 lbs for his June 7th catch-weight clash against WBC middleweight champion Sergio Martinez (51-2-2, 28 KO’s) in New York. Sergio Martinez, who will turn 39 in February. Although he has cemented his legacy in his own right, he has struggled with injuries over the last few years and he was pushed close to the edge in his last few bouts against Darren Barker as well as two more British boxers in Matthew Macklin and Martin Murray. Cotto, at 33 years old, is aiming for one last payday as well with many observers believing him to be past his days of glory and after some time off the sport, the man who has earned three world titles across three divisions is set for his final bow after the fight against Sergio Martinez. Cotto and Martinez will be fighting at a catch-weight of 159 lbs rather than the full limit of 160 lbs for the division. One pound shouldn’t make that much of a difference for this fight, but it’s likely that Cotto’s camp felt that it would give them an edge because Sergio might come in a little drained from trying to make weight. There’s no word yet whether there will be a weight penalty for this fight, but I wouldn’t be surprised if there is. For more information about Cotto vs Martinez Tickets click on the link. Timothy "Desert Storm" Bradley to defend his welterweight title against Manny Pacquiao. This ends months of speculation of Manny Pacquiao's next fight, and offers fans the long-awaited Pacquiao vs. Bradley rematch. When Pacquiao and Bradley rumbled the first time, on June 9, 2012 at the MGM Grand, Bradley's hand was raised via a controversial split decision, ending Pacquiao's welterweight title reign as well as his seven-year, 15-bout winning streak. Though both fighters claimed victory neither was satisfied. Destiny may have played a hand in their first battle but it will be survival of the fittest that determines the winner of this exciting rematch. Since then, Pacquiao was brutally knocked out by Juan Manuel Marquez, and Bradley scored a hard-fought decision win over Pacquiao's nemesis. Bradley also survived a war with Ruslan Provodnikov, while Pacquiao finally returned to action with a dominant win over an overmatched Brandon Rios. 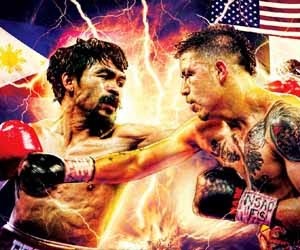 Promoted by Top Rank®, in association with MP Promotions and Tecate, Pacquiao-Bradley 2 will take place, Saturday, April 12, at the MGM Grand Garden Arena in Las Vegas, Nev. It will be produced and distributed live by HBO Pay-Per-View. Former junior middleweight champ Saul 'Canelo' Alvarez, whose decision loss to Floyd Mayweather Jr in September is ready to return to the ring. Alvarez (42-1-1, 30 KOs), Mexico's most popular active fighter, lost a majority decision - although most viewed the fight as one-sided - to Mayweather at the MGM Grand on September 14 in the richest fight in boxing history. Because of Alvarez's popularity with Hispanic fans, he was hugely responsible for the event's success. It sold 2.2 million pay-per-view subscriptions, second-most all time, but raked in an all-time record $150 million in domestic pay-per-view revenue. Among other records the fight set was for the biggest live gate in boxing history, $20,003,150, from the sold-out crowd of 16,146. That's why, despite the one-sided defeat, Schaefer has no qualms about putting Alvarez back on pay-per-view as a headliner. With the 31-year-old Angulo (22-3, 18 KOs) as the opponent, fans figure to get an action-packed fight. 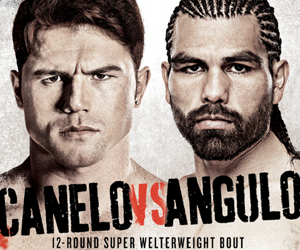 Angulo has been in several slugfests, although he lost his last fight, getting stopped in the 10th round by Lara in an interim title fight on June 8 in Carson, California. Angulo knocked Lara down twice, in the fourth and ninth rounds, but suffered serious damage to the orbital bone by his left eye and quit because of the injury during the 10th round of the brutal fight. Richard Schaefer is reporting high Canelo Alvarez vs Angulo ticket sales for the March 8th bout between former WBA/WBC light middleweight champion Saul “Canelo” Alvarez (42-1-1-, 30 KO’s) and fringe contender Alfredo Angulo (22-3, 18 KO’s) in their fight pay-per-view bout on Showtime from the MGM Grand in Las Vegas, Nevada. 6,000 tickets were sold on the first day alone, says Schaefer via Dan Rafael. Watch Pacquiao vs Rios on November 24 live on PPV. Or buy Pacquiao vs Rios tickets on November 24 at Cotai Arena in Macao China. Buy Martinez vs Garcia Tickets on November 9 at American Bank Center, Corpus Christi and Buy Ward vs Rodriguez Tickets on November 16 at Citizens Business Bank Arena, Ontario CANADA. Ruslan Provodnikov and Mike Alvarado appeared together at a news conference at Elway's restaurant previewing their WBO junior welterweight title fight set for Oct. 19 at the 1stBANK Center in nearby Broomfield. The bout, which represents Alvarado's first title defense, is being promoted by Top Rank and Banner Promotions and will be televised live on HBO. 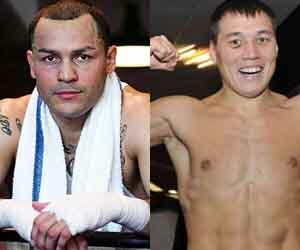 Alvarado will enjoy a 3 inch height advantage over the 5’6” Provodnikov, an advantage Mike will capitalize on with his superior boxing skills while Provodnikov hopes to turn the fight into a brawl as soon as possible, something that should never happen. Alvarado (34-1, 23 KOs) will make the first defense of his World Boxing Organization (WBO) junior welterweight title a “home game,” when he battles Provodnikov (22-2, 15 KOs), Saturday, October 19, at 1STBANK Center in Broomfield, Colo. This marks the area’s first world championship fight featuring a local fighter since September 15, 2000 when former World Boxing Council (WBC) lightweight champion Stevie Johnston unsuccessfully challenged defending WBC lightweight champion Jose Luis Castillo, via majority draw, at Pepsi Center. Alvarado vs. Provodnikov Tickets are already been sold and will be televised live on HBO World Championship Boxing®, beginning at 9:45 p.m. ET/PT. It will be the first time HBO has ever televised a fight live from Colorado. The International Champions Cup is an 8-team tournament pitting some of the world's best and most prestigious football clubs against each other in a series of elimination matches to be played July 27 - August 7. The World Football Challenge is now morphing into the International Champions Cup. After several years of one-off summer exhibitions, it will be a change of pace to see top teams in a tournament in which the winner takes home a trophy. In an additional wrinkle, one of this year's group games will take place in Europe. The new tournament, which is being called the International Champions Cup, will take place all around the U.S., with the final at Miami's Sun Life Stadium. There will be two groups of four -- Eastern and Western groups. The tournament, which has a major title sponsor and a TV deal, will be officially announced on Tuesday in Miami, with figures from several of the participating clubs on hand. The tournament, which will be played in six U.S. cities and one European city, will culminate with a championship match at Miami's Sun Life Stadium on August 7. 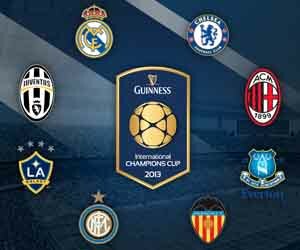 The 2013 International Champions Cup Tickets are still widely available at all leading box offices and sites online. We are happy to announce the availability of the said soccer tickets for all your needs. Likely this tickets will go out of booths so fast so we highly suggesting you order your ICC tickets as early as possible to secure exclusive seats for you and your loved ones. The buzz has begun for “Messi and Friends vs. The World”, the upcoming friendly that will unite the world’s great soccer stars in an event bringing the best players in the world to Chicago’s historic Soldier Field. Today the official word was released on when the world’s soccer fans can begin scooping up tickets to the once-in-a-lifetime event -- Ticketmaster will make the Messi & Friends versus The World Tickets available on Saturday, March 30 at 10 a.m. CDT. The July 6 all-star match is expected to sell out quickly, and will be led by Lionel Messi, the world’s first and only four-time Ballon d’Or winner as FIFA player of the year. Other elite soccer players participating include Javier Alejandro Mascherano, Guillermo Suarez, Diego Lugano, Jose Manuel Pinto, Cesc Fabregas, Alex Song, Emiliano Insua and Ricky Alvarez. In total, this friendly will feature 36 highly decorated soccer players uniting for charity, which is being coordinated by Numero 5, LLC. The match will be the final opportunity to see the world’s soccer elite together before the World Cup in Brazil in 2014. Tickets for the world-class match will be available exclusively from Ticketmaster, and are at several price levels ranging from upper deck seats beginning at $55 up to premium seats for $400. In addition to tickets for the public, a limited number of VIP packages are available. These packages include tickets, unprecedented field access, a meet and greet with players, and a jersey and ball autographed by Messi. It's on! Floyd Mayweather has just made things official-His next opponent will be WBC and WBA junior middleweight champ, Saul "Canelo" Alvarez. The contest, which will be contested at a 152 lb. catchweight, will be held on September 14 at MGM Grand in Las Vegas. Alvarez will bring his WBC and WBA 154 lb. belts to the affair, as well as the Ring Magazine title, while Mayweather will put up the WBA "super" junior middleweight title he won from Miguel Cotto last year. The pay-per-view telecast from the MGM Grand in Las Vegas will likely generate the kind of buy rate Showtime had envisioned when they first signed the controversial Mayweather to a six-fight, 30-month deal, rumored to be the richest in boxing history. Alvarez, who will be 23 by fight night, has proven himself a draw in the United States as well. His April 20 unanimous decision win over WBA titlist, Austin Trout at a jam-packed Alamodome in San Antonio, Texas, also won the young fighter a certain level of boxing "street cred" after being widely criticized for a relatively weak recent stretch of opposition. Mayweather should hold most of the cards against the young, relatively flat-footed Mexican champ. With an edge in speed, reflexes, and a massive advantage in overall ring smarts, Mayweather will likely be the heavy betting favorite and could, conceivably, take a wide unanimous decision. Mayweather-Alvarez was the right fight to make and it should be a truly intriguing match-up. Who do you think will win? 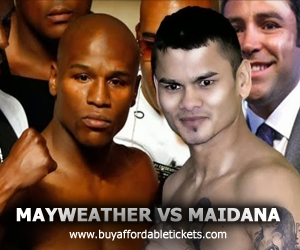 The Mayweather vs Alvarez Tickets become available, they can be browsed and bought right here! So, you should buy your tickets before the sale ends. You must get the tickets as soon as it is available because they sell like hot cakes. Barring late complications, the U.S. men’s national team friendly against Germany on June 2 will take place at Washington’s RFK Stadium, the Insider has learned. The U.S. Soccer Federation has also been considering FedEx Field in Landover, Md., and, in case a deal couldn’t be reached with the D.C. area venues, MT Bank Stadium in Baltimore. The match is tied to the USSF’s centennial celebration and would cap the federation’s annual general meeting, May 31-June 2 at the Hyatt Regency on Capitol Hill. Although a deal has not been finalized and an announcement may still be several weeks away, RFK has emerged as the clear front-runner, according to one source. The stadium’s soccer history and location inside the city worked to its advantage. Capacity of about 45,000 is also more in line with ticket-selling expectations than FedEx Field’s 79,000. The USSF staged a U.S.-Brazil friendly at FedEx last summer. [In a poll posted in January, Insider readers voted overwhelmingly in favor of RFK over FedEx for the U.S.-Germany match.] Per a long-standing policy, the USSF will not comment on the proposed game until a contract is signed. However, the German federation (DFB) has already listed a U.S. tour, featuring friendlies against Ecuador on May 29 in Miami and the United States on June 2 in Washington. Tickets for the US vs Germany are undoubtedly too hot and demands for it are too high. We are suggesting that you should buy USA vs Germany Soccer Tickets as early as now to secure premiere seats and avoid the inconvenience and hassle. Justin Drew Bieber is a Canadian pop musician, actor, and singer-songwriter. Bieber was discovered in 2008 by American talent manager Scooter Braun, who came across Bieber's videos on YouTube and later became his manager. Justin Bieber was signed by Usher at the tender age of 14 and has achieved incredible success ever since thanks to his passionate Belieber fans. His videos receive millions of YouTube views and he is among Twitter's most-followed. Bieber released his first single, "One Time," in May 2009. Supported by a popular video that featured an appearance by Usher, "One Time" went platinum in both Canada and America, a feat that was replicated later that year with the release of My World. The disc was technically an EP, featuring only seven songs, but it reached number six on the Billboard 200 album chart and sold over a million copies. Less than a year after his debut, Bieber returned with the "second half" of My World, a ten-song release titled My World 2.0. Further demonstrating his and his management's marketing power, over 8,000 fans who pre-ordered My World 2.0 had their head shots used in a photo mosaic (formed to look like a portrait of Bieber) that was displayed on the back side of the disc's booklet. The release topped the Billboard 200. A few weeks later, a combination of My World and My World 2.0, titled My Worlds, appeared in some territories. Grab Justin Bieber tickets today to see him entertain the crowds! Copyright © 2009 Entertainment Hub.